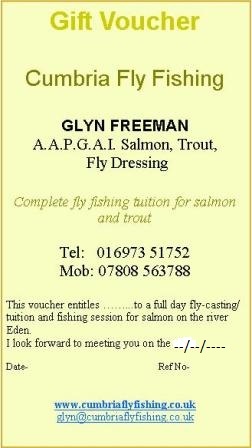 Fly casting tuition, lessons, courses and fly fishing experience gift vouchers can be the ideal gift for someone that you do not know what to get for those special occasions. 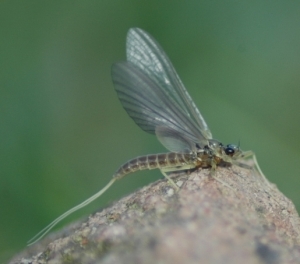 Whether they already fish and want to improve or have thought about trying fly fishing, we can tailor make the day or half day to suit whatever that special person wants to achieve from beginner to advanced. It is very easy, just click onto the email link on the bar above or phone 01697 351752 and tell me what message you would like written on the envelope along with your address and I will do the rest. 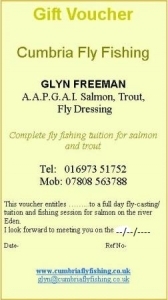 The envelope and gift voucher will arrive in a brown envelope F.A.O to you, when you receive it, payment is easy by either a cheque to Cumbria fly Fishing in the post or the secure payment on-line facility below. When the person receives the voucher they then phone me with some dates they have in mind and we will arrange a time and meeting place with all the relevant details. I can supply all the equipment needed on the day along with tea/coffee, fishing, tuition and photos, there is nothing more to pay except a one day E.A rod license available on-line or from any post office. 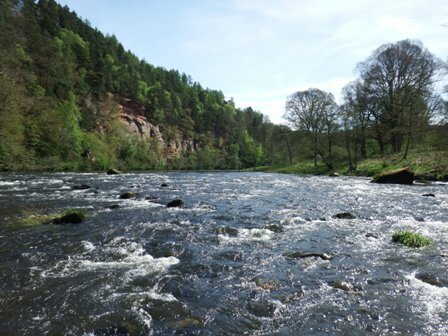 Cost: Full day fly fishing/tuition £180 – half day £95. Vouchers are valid for one year from time of purchase, if for any reason the day does not go ahead due to the river being in flood or you have a disaster we will re-schedule the day at no extra cost. Tuition and fishing experiences can be a half day, or full day/s session/s on the various private beats I use on the lower/middle river Eden. You will get the full benefit from the day on a one to one basis. If there are two people please add £50 for an extra permit. (excluding E.A rod license if you want to fish). For larger groups of three or more people I will have to arrange a different beat for the day that will accommodate the extra numbers and possibly another qualified instructor, there will be an extra charge for this depending on time of year and the cost of the beat. (waders, tackle and safety gear).